Star Wars 9 is currently filming in England and some new set pictures from the Black Park location have leaked online. These new pictures are reportedly from the second set and they feature a jungle area with tall trees and vines. The first set on this location was shown last month when pictures of the Millennium Falcon leaked, in the same location. Pinewood Studios sources have revealed that Star Wars 9 was going to film some jungle scenes in Laos, but that idea may have been scrapped in order to stay in England. Over the past few weeks, the Black Park set of Star Wars 9 has seen some pretty big changes. Vines have been added as well as tropical trees, which give the area more of a jungle-look. In addition, it looks like they could be constructing a cave for a possible base. This has not been officially confirmed, but it would make sense since the Resistance is reportedly searching the galaxy for new recruits. It isn't clear what planet this set will be at this time. Star Wars fans are hoping for planet Batuu, and there has been some pretty intriguing evidence to suggest that the jungle setting could very well be that planet. Star Wars: Galaxy's Edge at the Disney theme parks is currently constructing the outpost planet and a new set of books about the Millennium Falcon include the location as well. If that wasn't enough, there concept art for the planet from Disney looks pretty similar to what we're looking at in the newly leaked set photos. However, the Star Wars 9 set photos could also be for Yavin IV. The location is the home planet to Poe Dameron, and is the spot where his parents planted a Force-sensitive tree that was given to them by Luke Skywalker. Since the Resistance needs a new home base, Yavin IV would certainly make a good place to set up. There's a good possibility that Yavin IV will be revisited in the final installment of the new trilogy. Again, this has not been confirmed officially, and these set photos could very well be an entirely different new planet. 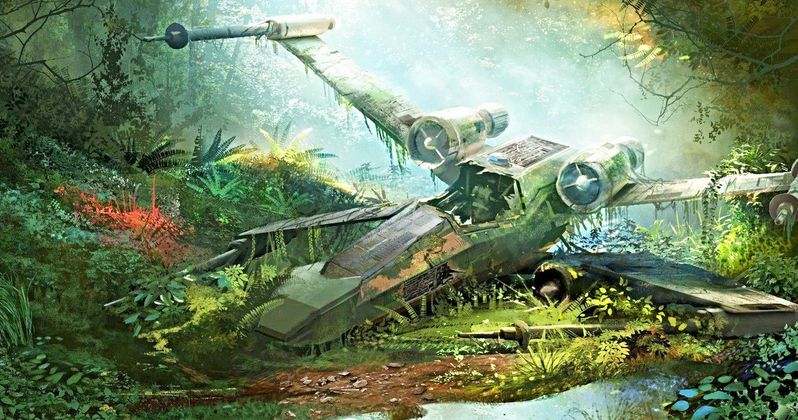 The jungle setting of the latest Star Wars 9 set photos also look pretty close to Endor, which might scare off some fans. But, it is highly unlikely that J.J. Abrams would take the last installment of the trilogy and bring it back to Endor like the last film in the original trilogy. Or would he? It might be time to see some of our favorite Ewoks return to help take down the First Order, or at least the ones that survived the supposed Ewok Holocaust after the explosion of the Death Star. You can check out the set photos from Star Wars 9 below, thanks to the Making Star Wars Twitter account.